Rather on the quiet, Ellington Properties has been busy beavering away on its first couple of projects in Jumeirah Village Circle (JVC). The developer currently has 14 projects collectively worth around $2 billion (Dh7.34 billion) and combining for some 2,200 residential units. And despite being new in the market, the company has been very upbeat with its prospects. Ellington’s land bank of more than 3.5 million sq ft has been self-financed, according to Thomas, with wealthy private investors Vikrant Bhargava from London and Dubai-based Raghu Kataria investing in the company. Seven of the company’s projects are under its core development portfolio, five are part of its rental portfolio and two are under its development advisory business. The company also has a facilities management subsidiary, Chrome & White. Belgravia, one of the company’s inaugural projects in JVC, has already topped out and will be completed by the end of the year. A four-storey apartment building, Belgravia will have 181 units, comprising one- to three-bedroom apartments. Amenities include a garden with pool and children’s play area. A one-bedroom in Belgravia costs around Dh850,000, with prices varying depending on the view. The project could attract net rental yields of about 8 per cent, says Booth, in addition to strong capital growth over the next four years. Ellington has installed live cameras on-site for clients to view construction progress. It has also recently held a topping-out party for its clients. ”We want to show them what is physically happening on-site,” says Booth, adding that the company does not market any project unless at least 20 per cent has been constructed to shorten delivery time. ”Trust is a big component in real estate business. People are giving you their money for the biggest investment in their life,” Booth says. Its other project, a high rise in Downtown Dubai, is under construction. The project was awarded best multifamily designed building in the region at the Arabian Property Awards. 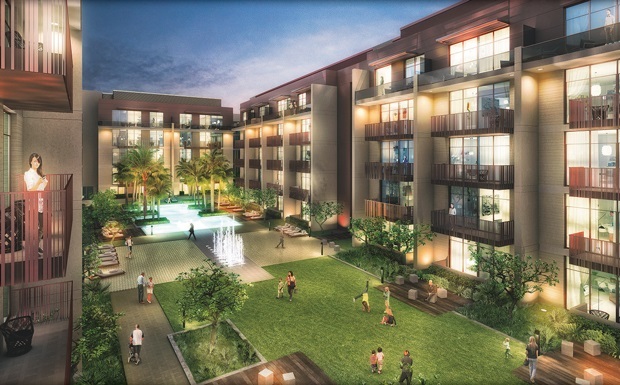 ”This 130-unit boutique building is also design-led and will be completed within 22 months. We haven’t released it yet to the market,” says Booth. The developer also has four villas under construction in the Ellington Collection on The Palm Jumeirah’s N frond. The contemporary villas feature an open-plan design with grand staircases and sliding windows. ”Nothing like it exists anywhere on the Palm. We’ll have them done in about 18 months, and certainly want to build somemore,” says Booth. The company’s villa portfolio also includes a 38,000-sq-ft property in Emirates Hills, which is also under construction. Its advisory portfolio includes RP1 in Business Bay, which is in the design phase and will start construction in November, and the 50-storey RP Heights in Downtown, which has completed piling and is 70 per cent sold. Robert Booth, Co-Founder and Managing Director of Ellington Properties, talks about the nuances of investing in the property development sector. – You are placing emphasis on creating a rental portfolio, why? We’ve done a lot of research globally, particularly with the young demographics in Dubai, [and we found] there is a huge business opportunity for us and a real need for innovative product in the rental segment. We often forget that 85 per cent of people who live here are renters, one of the highest demographics of any city in the world. – So what will be different at your rental properties? What we want is to give people certainty and bring a product that has energy with strong amenities. Lobbies, for example, are often unused. They should become vibrant social spaces with beautiful designs and Wi-Fi – things young people want. – How will this model serve you as a business? Professionally run and uniquely designed rental accommodation balances our development cycles, which can be up and down. Rental is a steady stream of income and we believe we can create products that don’t exist in this marketplace. – Where will we see these rental units coming up? Three rental buildings are already under design and construction this year in Jumeirah Village Circle [JVC] with 500 units, and two projects will start construction this year in Majan. Build time is about 20 months. This is the first wave. We’re planning a couple of thousand of these rental units to grow our portfolio significantly over the next few years. – Will they be affordable? We’ll have studios to two-bedroom apartments – design led and elegant, yet affordable. A studio would be around Dh45,000 to Dh50,000, and a one bedroom would be between Dh60,000 to Dh75,000. – You talk about functionality and quality, what does it entail? Most places around the world offer a two-year warranty on your home interiors, but not here. We will [offer warranty]. Lockers in the basement are also standard in North America. We have created some space for those in our buildings as well. In Belgravia we have Wi-Fi in the lobby, pool and gym. We’ll do the same to our rental properties. It’s the little things that matter. – How do you manage to be profitable? We’re happy to cut our margins a little bit, but we are also very smart with our design, spending the money where it really matters, and where the customer sees it. For example, 50 per cent of what consumers see is landscaping – it’s the smartest investment. Your interiors generally represent around one-third of the cost of your building, a third goes to the structure and a third to mechanical, electrical and plumbing. So we’re saying if we spend a little more on interiors, we could deliver a beautiful product. In the long run that gives you the pricing power. The market, given the choice, will pay for quality at a reasonable price. – You have been the CEO of Emaar for many years and was also involved in real estate projects all over the world. Why did you set up a business in the UAE? I’ve been involved with building 40,000 homes on over five different continents, so I have a lot of experience, including mistakes, but I don’t repeat them. The macro story of the UAE and Dubai is very compelling, thanks to the government’s foresight in diversifying the economy away from oil. The real estate is the net benefactor of its massive investments into infrastructure. Take the $2 billion [(Dh7.34 billion] Dubai canal project. You’ll be able to walk in 10 minutes from Business Bay to Safa Park, or jog down to the Arabian Gulf and back in 45 minutes, all on the water’s edge, and boats will be going up and down. The Metro, roads, social and cultural infrastructures have been created, that’s the great macro story. Then, if you ask people where they want to live in terms of global cities, Dubai is cheap by international standards. We sell a one-bedroom for $200,000; you can’t even buy a parking [space] for that in London. The population is forecast to grow by 150,000 every year here, and it’s a strong second home city. We don’t want prices to get out of whack as then people can’t afford it. We want steady growth and to build a better city, providing nice homes for people who want to live here. – So you’ll be building in Business Bay as well. Where else? Yes, we’re actively looking at Business Bay, more rental units in JVC and other established areas, and at the right time we will be looking for a more significant piece of land, where we can develop a bigger mixed use community. – You’re said to be still advising Emaar Chairman Mohamed Alabbar? I do a whole bunch of advisory work for a lot of people. I sit on the board of an Indian realty group as well and do other pieces of work for other people around the world. – So when do you sleep? Einstein said the average person only uses 4 per cent of their brain capacity. We still have some gas in the tank.